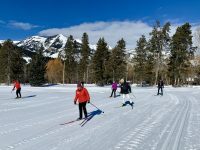 Nordic, cross-country, skate skiing is happening in Jackson Hole now! 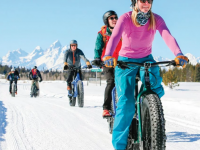 Join the Jackson Hole-Teton Nordic Alliance, Jackson Hole Mountain Resort, Skinny Skis, and Grand Teton National Park Foundation to support Community-sponsored Nordic grooming in Grand Teton National Park this winter. Please direct all gifts to Grand Teton National Park Foundation – marked ” Grooming” at: www.gtnpf.org/donate. The current plan is for GTNP to groom early in the week, and community-sponspored grooming at the end of the week (Friday). Grooming is weather dependent. Grooming will cover from the Taggart Lake trailhead north to Jenny Lake, continuing on to Signal Mountain Lodge. Parking is available at the Taggart Lake trailhead (south) side as well as on the north side at Signal Mountain Lodge. 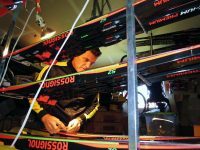 Check out the trail on JHNordic.com. This Teton Park Road trail is one of the most scenic Nordic groomed trails in the world. The first 6 miles from the south are flat, so easy for all abilities. The trail from Signal Mountain in the north is also level for the first 3 miles, then climbs gently through the forest up to the Snake River bench and open terrain. The trail is groomed for classic cross-country skiing as well as skate skiing. Snowshoers and walkers are welcome on the side of the groomed trail. Dogs on leash are permitted. 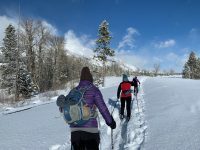 Join JHNordic to support this community collaboration with Grand Teton National Park, to provide an incredible experience, with the bigger views of the crests of the Tetons.